‘Geroezemoes’ is the sound of a crowd of people talking but without it being distinct what is actually being said (like ‘buzz’ or ‘hum’). In Dutch one creates the noun that expresses the activity of a specific verb by taking the stem of the verb and preceding it with ‘ge’, e.g. for the verb ‘schreeuwen’ (to scream) the noun becomes ‘geschreeuw’ (screaming). In a similar way one can create the noun ‘geroezemoes’, however the verb ‘roezemoezen’ is hardly ever used (in my experience; I have actually never encountered it). Although you may not encounter it often, the noun ‘geroezemoes’ is common vocabulary. – Roezemoezen: to buzz, bustle, hum [verb] [roezemoesde, geroezemoesd]. – Mompelen: to mumble [verb] [mompelde, gemompeld]. – Achtergrondgeruis: background noise [noun] [het geruis, <no plural>]. This entry was posted in Dutch word of the day, DWOTD 1.0, Vocabulary Intermediate and tagged geroezemoes, roezemoezen by Sander. Bookmark the permalink. This one’s going straight into my oral lexicon for this evening. BTW, may I suggest “hubbub” as a translation? That’s more of the din aspect and less of the hum. Thanks Chris, I will add it to the main translation. Any particular example where ‘hubbub’ is better? It’s actually quite instructive for me because I always thought hubbub referred to that sort of hum of voices that make them indistinguishable from each other, but is not too loud or unpleasant overall. 1. A chaotic din caused by a crowd of people. 2. A busy, noisy situation. You live and learn (with the aid of DWOTD :-)). It’s interesting, ‘geroezemoes’ can be used for both the chaotic din and a bit of buzzing/humming. 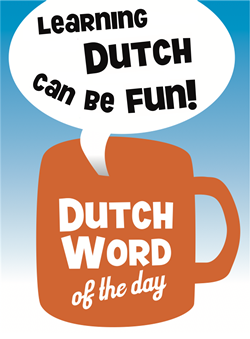 You’d distinguish by using a suitable adjective or by saying ‘een beetje geroezemoes’ or ‘een hoop geroezemoes’. This one could easily make Dutch Word of the Year for me.